It’s been fourteen seasons, and I thought this show couldn’t surprise me anymore. I was wrong. This Monster of the Week was a mystery worth solving, as our favorite brothers tried to rescue meek Maggie from the aftermath of her first solo hunt. After Maggie is jumped by what appears to be the ghoul she was hunting, we cut to “Chief” Sam lecturing to the Bunkerites about the importance of lore before sending them out into the field. “You kids have fun out there,” Dean advises, and though Sam is chagrined, Dean respects what he’s trying to do, even as he kids him about it. I like seeing Sam in charge, all the brains of the operation. I think Dean does too. 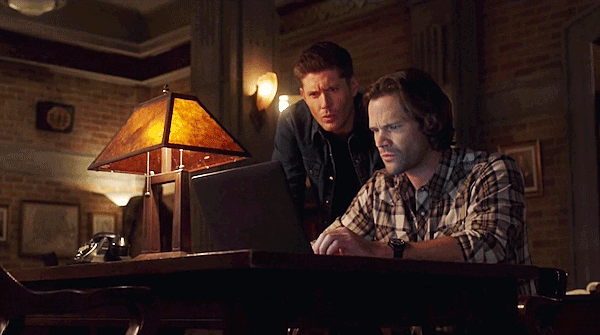 Sam’s phone keeps bleeping with “Hunter Check-Ins” while Dean does his favorite thing of all—worry about Sam. 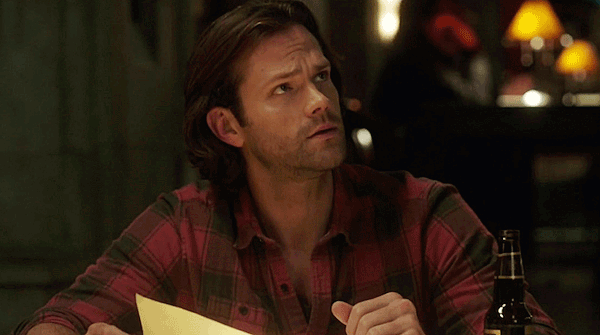 Sam’s not sleeping or eating enough, because he’s worrying too—about the 16 hunters he has out working cases (not including the Cas/Jack and Alterna-Bobby/Mary combos.) 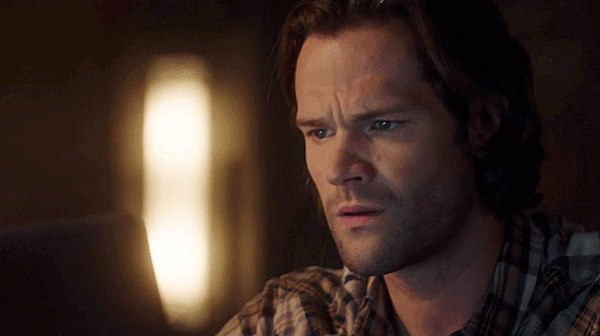 It’s realistic, showing Sam worried that he’s not prepared the Apocalypse World hunters enough. He wields his power responsibly, as we knew he would. When Maggie’s body cam footage shows her being jumped, the boys think ghoul, too. It’s even more realistic that Sam feels Maggie getting jumped (and maybe dying, too) is his fault. After all, nobody carries guilt like a Winchester. I liked that Dean was the optimistic and sensible one here, telling Sam they didn’t know what happened to Maggie and that she could be alive. I liked, too, that he talked about bringing Maggie home. It’s a big thing, watching him share the Bunker with relative strangers. My heart grew three sizes, watching that. Did anyone else think perhaps the intense groundskeeper was involved in Maggie’s disappearance? I did. This episode kept me guessing at first, and that’s a welcome thing. I was trying to guess, too, what had nabbed Maggie as ghouls don’t eat live and they don’t, as Sam so astutely put it, keep prisoners. I liked not knowing what was going on. Predictable? This beginning of the episode was not that. Sam and Dean bumping into Bobby and Mary running the same National Historic Preservation Society con? Loved it. I was confused by Bobby’s attitude at first, but it was great hearing him call Sam and Dean, in so many words, idjits. And the intrigue about what nabbed Maggie really ramped up when it turned out that the owner of the “historic house”, Patrick Rawling, had the same face as the monster, even though Patrick was in a coma from a stroke, looking about ready to kick it. When the camera cut to an imprisoned Maggie, I was struck by two things: one, that looks like the setup of a Djinn, and two, Katherine Evans should be recognized for her performance, because her stuttering gasps and quiet pleas for help really looked authentic. Alterna-Bobby (Can I just call him Bobby now? 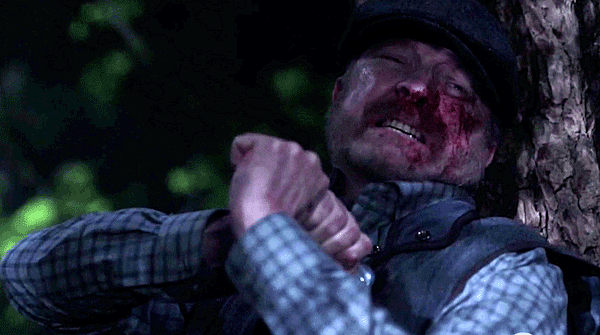 Or is that disrespectful to our Bobby Singer?) laying into Sam for sending Maggie on a hunt that definitely wasn’t a milk run? That was a little unexpected. Dean and Mary defending Sam? That was not. Bobby really is being unfair to Sam on some level, but I gotta say: I wouldn’t have sent little Maggie out solo for a long, long time, so I kind of see his side too. 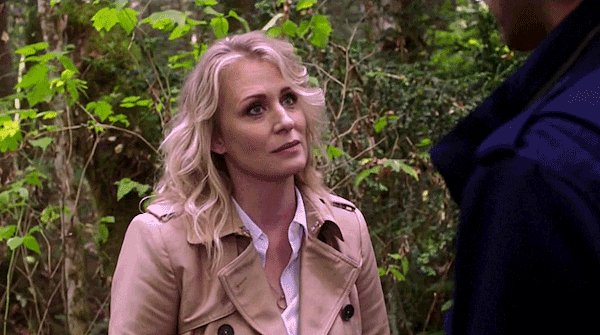 Mary and Sam’s sweet talk in the woods, where she assured him that he was born to lead was lovely, and her ability to talk to Sam about her growing…love?…for Bobby was adorable too, if a little awkward. It was bittersweet to hear her mention John, especially an open-hearted John that Sam certainly never knew, and sad to hear Sam talking about our Bobby, the man who raised him. (Side note? Samantha Smith’s smile when she realized she might not want to talk to her son about dating was glorious.) I’m sad Sam will never really get to see her as a mom to him as a little boy, but I’m glad their relationship has found some footing as two adults. At first I didn’t get the cabin thing, but now, knowing what the monster was, I wonder if that dead hunter’s nightmare was being the hunted and not the hunter. 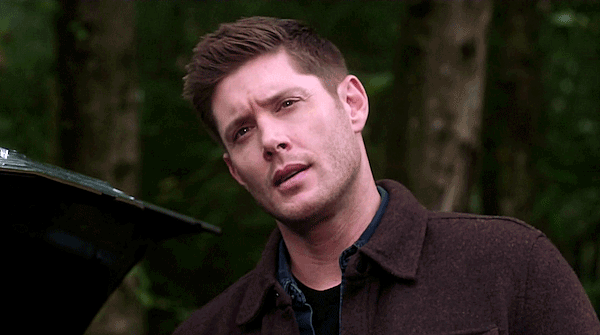 And when Dean killed the “ghoul” and it burst into dust? Did anyone else have Buffy the Vampire Slayer flashbacks? ‘Cause I did, and that’s never a bad thing. Also? What the hell? What kind of ghoul dies like that? “Oh, good. You told ‘em.” Ha! 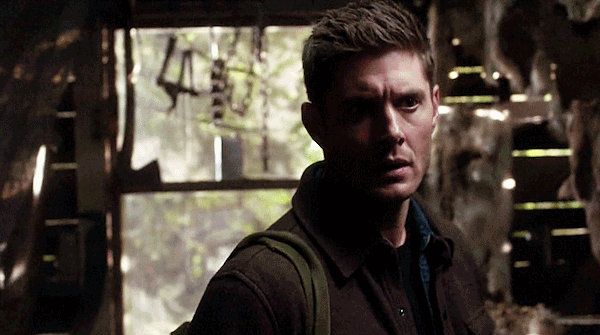 I love Dean’s aplomb about the fact that they hunt monsters and he casually found a dead hunter in a shed. 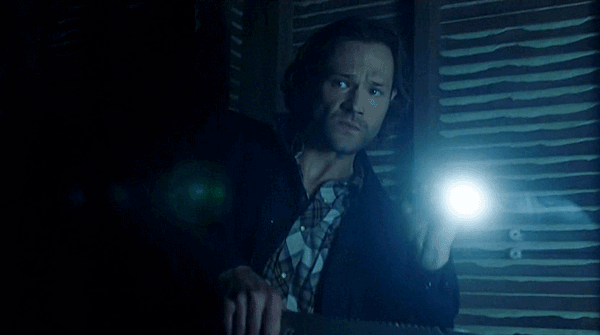 When a “monster” keeps Rawling’s daughter Sasha from investigating the attic, Sam and Dean both know that’s the place to go, but before that I loved the looks on Sasha and Rawling’s nurse Neil’s faces as the boys theorized that it wasn’t monsters at all (relief)—it was the manifestation of a witch or a psychic (I’m sorry…what?) 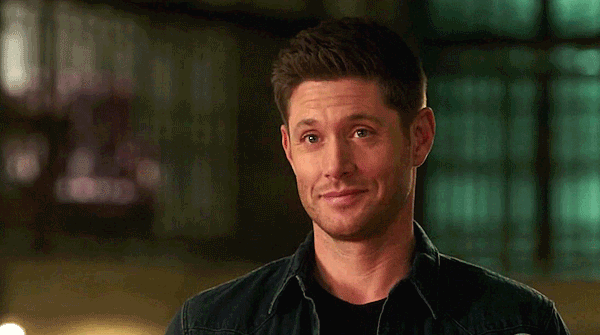 “Oh pal,” said Dean, “You have no idea what’s possible.” Sam tries to give a reassuring smile to Neil, but Dean is on the case, and he has no effs to give about someone else’s confusion. No. Effs. Whatsoever. Dean’s lack of effs carried over to sharpening his machete in front of Sasha (not a euphemism) but that could only last so long. He engaged Sasha in talking about her absentee dad and her suicide victim of a mom. His quiet “sorry” was poignant, and his advice to let the past go and move on? Surprising, coming from him. 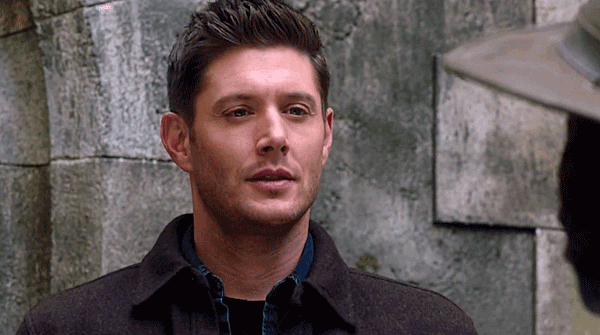 No one carries baggage like Dean Winchester, and I doubt he’s turned over a new leaf. Sam finds Maggie in the attic, and once again, Evans’ acting is spot on. Sam kills the vampire—wait, what?—that was keeping her prisoner, and like Dean’s ghoul, it Buffys into dust. WTF, mate? I was really confused by this point as to what the hell the boys were up against. Sam and Maggie had great chemistry in that moment, he as a caring leader, her as an apologetic stray. I never cared much about Maggie until now, but maybe—just maybe—she can become a Wayward Sister of the Bunker. 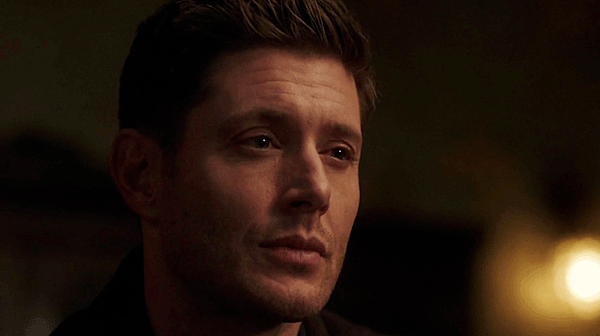 For a second it looks like we might find out what Dean’s are, but the Djinn is almost overcome when he tries to read Dean’s mind and sputters out a “You…you…” (What is THAT about?) 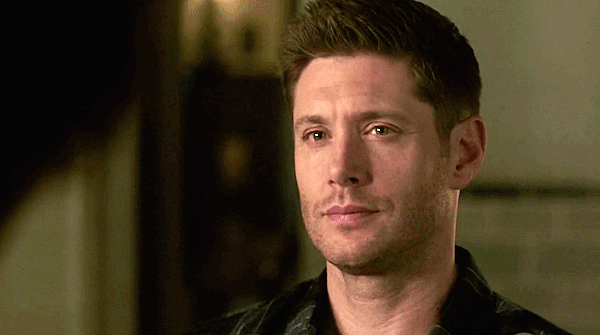 The creepily smiling Djinn warns him that there are dozens more out there, waiting for Dean’s family. 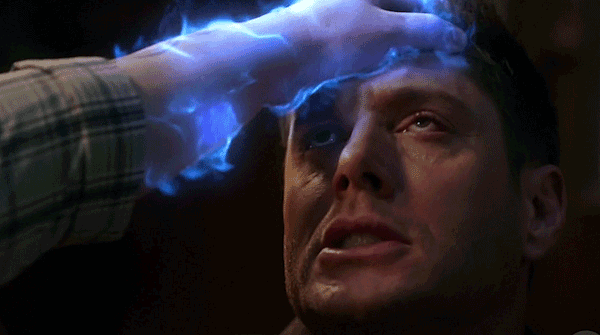 With no lamb’s blood anywhere, Dean manages to bludgeon the Djinn to death, with a deadpan delivery of “You don’t know my family.” I always thought Dean’s nightmare was the idea of burying Sam, but is there more? That Djinn sure seemed to think so. Color me intrigued. 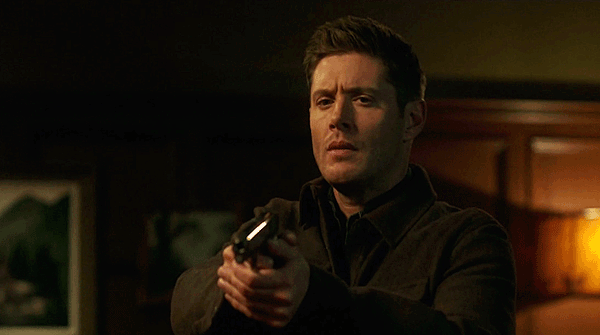 And Dean unloading his gun into the dead Djinn? Defined the word overkill. Bobby tells Mary about Daniel, the son he went to war with after they buried his wife who died an unnatural death. They hunted together, and then, during the angel war, they were separated and Daniel died. Bobby never even found his body. 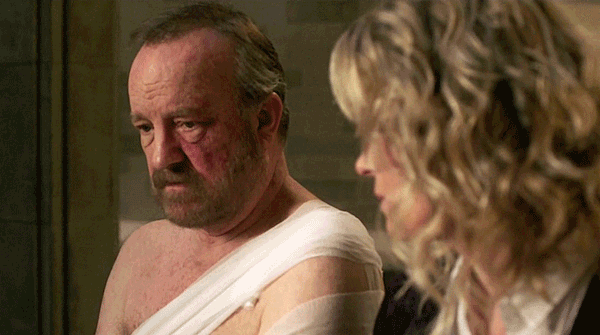 Jim Beaver delivered the whole thing with gravitas and pain, and man, am I glad he’s back on my screen. It’s a lovely bonding moment for Mary and Bobby. I’m not sure how I feel about them as a couple (Isn’t Bobby a little old for her? Just saying.) but if they find happiness with each other? I guess that’s all that matters. I do like that they decide to take a break and go hole up in Donna’s cabin for a while (Which, as a nice touch, has a garden gnome. That sounds like Donna.) 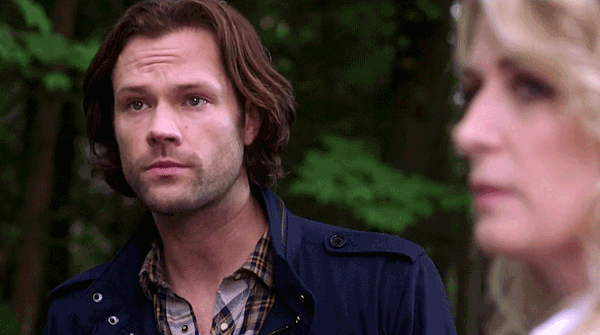 And I love that Bobby absolves Sam, and Mary assures Dean she will always be available to him. Maybe Bobby and Mary were inevitable, with all they have in common. 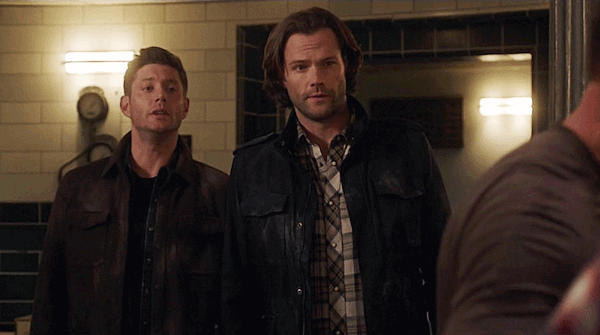 Sam and Dean warn Garth (Yay! He’s still alive!) and all the other hunters they know that more super monsters are on the loose and to be aware. Dean still feels guilty about letting Michael into the world (so much for letting it go) and can’t move on from what Michael did. Sam tries to tell him they’ll work harder—he’ll sleep two hours a night instead of three if he has to—until they find Michael and kill him. 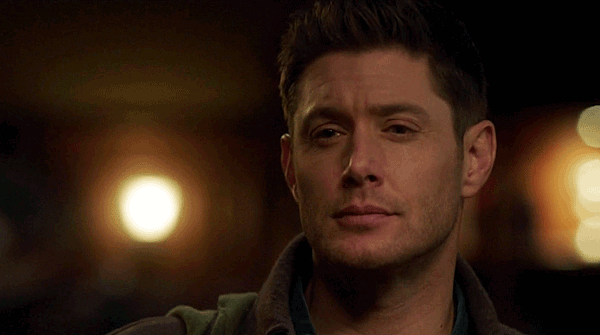 “I hope you’re right,” Dean manages to say, leaving Sam with his thoughts, and man, I hope he’s right, too.